Imagine it’s a beautiful summer day. The sun is shining, there’s a little breeze to keep you cool, not a cloud in the sky, and you’re… sitting on the toilet. Yep, another summer day and you’re trapped in the bathroom with diarrhea or constipation. Summer is for enjoying the outdoors, barbecuing, and sipping a cold drink – not for suffering on the toilet. But whether you can’t go or can’t stop going, you likely have one issue in common: dehydration. And more time in the bathroom isn’t the only side effect of dehydration. Being dehydrated impacts every aspect of your life. 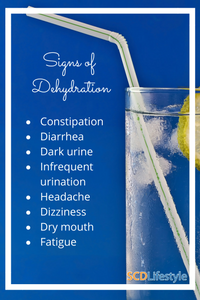 And if you don’t address these signs of dehydration early on, you can experience severe reactions like heat stroke, seizures, and even comas. If you want to support your body in healing, and feel amazing, you have to get and stay hydrated. You may think you’re really well-hydrated if you’re drinking eight, 8 ounce glasses of water a day (that’s what we all learned in school after all!). But if you’re having regular diarrhea, there is a very good chance you’re dehydrated. And if your stools are hard and difficult to pass, it’s likely dehydration is contributing. While we normally recommend drinking to thirst (meaning drink when you’re thirsty, stop when you’re not), if you’re really struggling with constipation or diarrhea, or you have any of the above signs, you might need to be more intentional about getting hydrated. That means if you’re trying to get hydrated, you need more than just water. And if you become dehydrated, your electrolytes may also become imbalanced. Electrolytes like potassium, magnesium, and sodium are like a light switch for your body. They carry electrical impulses across your cells and activate hundreds of processes inside the body (things like nerve impulses and muscle contractions). Your kidneys are responsible for maintaining proper electrolyte balances in the body. However, this system can be thrown off by lots of sweating or diarrhea, for example. That’s where electrolyte and hydration drinks come in. They provide some sugar and some sodium to help your body better absorb water and other important electrolytes. But not all hydration and electrolyte drinks are equally beneficial. If you just buy something at the store, you’re likely to get electrolytes alongside artificial colors and flavors, artificial sweeteners, and more. 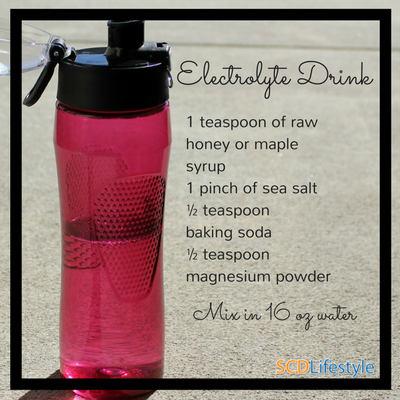 Luckily, it is really easy to make your own electrolyte drinks. You probably even have all the ingredients you need in your kitchen right now. This drink is a great choice for those who are feeling dehydrated, sweat a lot (like if you work outside in a hot climate), or are struggling with constipation. Two common causes of constipation are being dehydrated and not getting enough salt in your diet (which contributes to dehydration). This recipe helps both! (If you need more tips for overcoming constipation, check this out). Over in the private Solving Leaky Gut Facebook community, this recipe is a favorite for squelching constipation. Plus, it’s the easiest recipe! This is my favorite drink on a hot summer day AND it can help boost your digestion while hydrating you, thanks to the addition of lemon juice and raw apple cider vinegar. (Both create a more acidic environment in the stomach.) If you don’t have adequate stomach acid, you can’t break down and absorb the protein that you eat. I love to sip on this while I’m preparing dinner to get my digestive juices flowing. If you’re dealing with chronic diarrhea, your electrolyte balance can easily be disrupted. 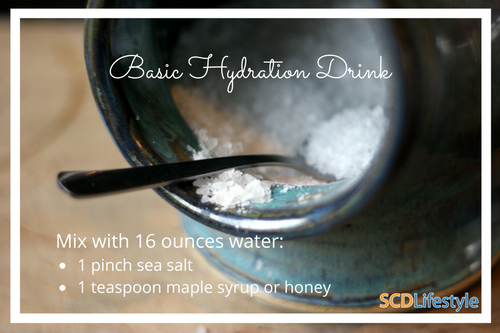 If I’ve had a flare of symptoms, I incorporate this drink (and the rest of the advice here). You can also add ½ cup of fruit juice to improve the flavor. Don’t feel like making a drink yourself? You can also try some coconut water (make sure the one you pick has no added sugar) or Lyte Balance electrolytes. I hope you enjoy these drinks as much I do. Let me know your favorite electrolyte drink recipes in the comments! I often feel dried out, even though I drink a lot of water. I pee a lot, and it’s often almost clear. I feel like the water shoots through me. What does this mean? I was recently hospitalized for 3 days after going to the ER for kidney stones. My hemoglobin was 7.5 and now I’m waiting to see a GI doctor. My cortisol level was at a 5 at 8 AM and I’ve been told to see an endocrinologist for possible adrenal fatigue. I’ve lost 36 pounds in a year and my hair is falling out to the point I’m going to have to cut it short. I can hardly manage to get dressed every day and have constant headaches. I don’t recognize myself anymore..inside or out. Could all of this be from a leaky gut? Hi Kathy – it sounds like you’re suffering from adrenal/hormone issues and a leaky gut is part of this. Thanks for all this info. I am absolutely desperate. I was diagnosed with coeliacs in 2008. I tick almost every symptom box for leaky gut – I also have polycystic ovaries. A gluten free diet has not fixed me. I have tried every kind of diet there is out there to try and sort myself out – Paleo – too high fat made me very inflamed – vegetarian, pescatarian – I have been vegan for most of this year and say some initial improvement in the first 3 months (3 months seems to be when things start to go wrong on all diets I’ve followed). 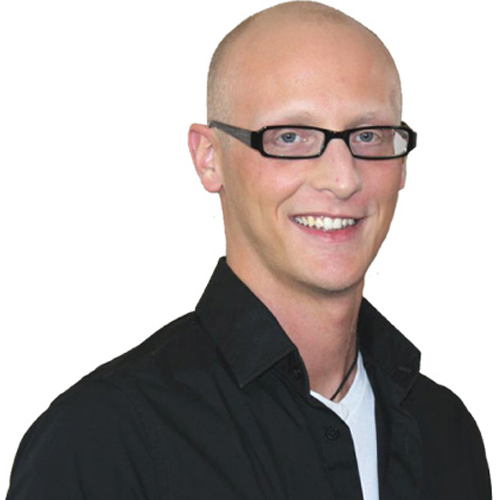 the last two weeks I have been incredibly tired and had lower back pain and severe scalp psoriasis – I am constantly bloated and constipated. I am going to take a leap of faith and try a strict SCD diet – crazy how miserable food can make you feel. Hey Kat – I’m sorry to hear how much you’ve been struggling. Sometimes when we’re sick we cling to different diets because they feel like the only hope (I know I sure did!) but it sounds like you’ve tried just about everything except listening to your intuition. What does your intuition tell you you need to eat? In my experience, any kind of very strict diet (whether SCD or vegan) can work for a period of time – but then people usually crash. Thats because a restrictive diet isn’t helpful long term – for optimal health we need to include as many foods as possible. When you click on the maple syrup or raw honey links, all the products you see there are they safe for the SCD diet? Wow. Thank you for this article, the timing couldn’t be better! I’ve been struggling with these symptoms for the past several weeks and seems to be getting worse. I’m celiac and suspected gluten contamination but have found no culprit. How many drinks recommended per day to reverse dehydration? A good sign you’re well hydrated is clear or very pale yellow urine with little or no odor. Hey Bill – great question. Most of these recipes use a very small amount of honey or maple syrup (1 teaspoon). For most people, this small amount is OK to consume. The purpose of this teaspoon of sugar is to increase water absorption in the gut – not to provide a sweet taste. Of course everyone is an individual and as a diabetic you’ll need to work with your doctor to see what a safe amount of sugar to take in for you is.